Oh I don’t know how summer has gotten away from me already! We have had a heat wave in Boston, which makes me not want to heat up the stove. Well hello there, grill! 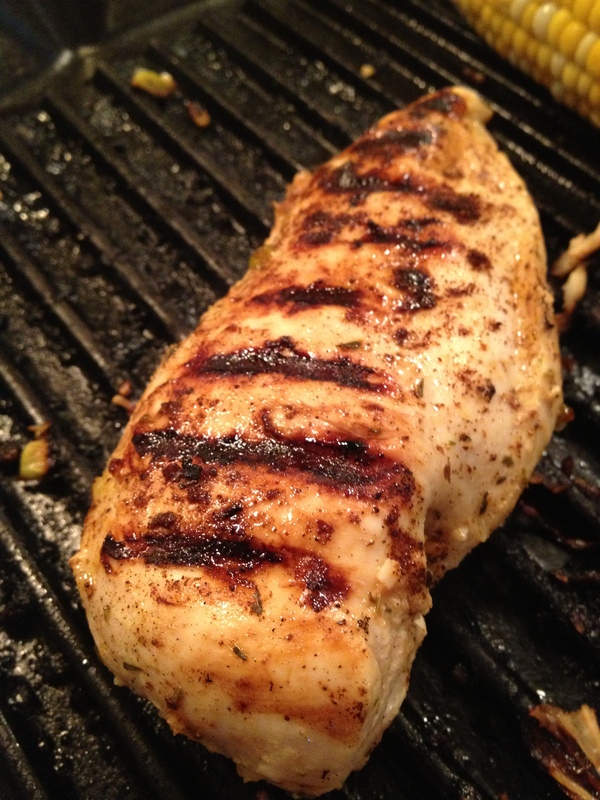 I made some grilled chicken this week that was perfect for summer… it has a fruit juice base which makes for great flavor. Hope you enjoy it! 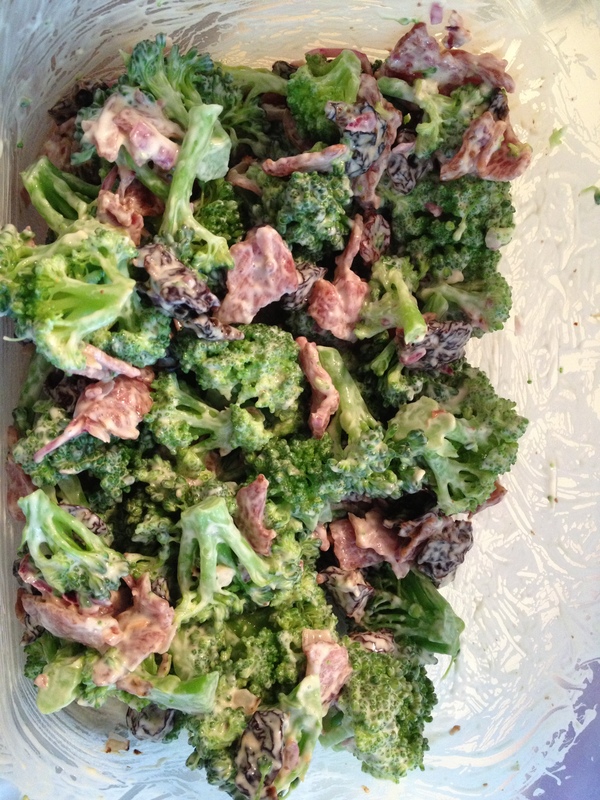 Combine all ingredients in a large plastic bag or bowl and mix well. Add 2-3 chicken breasts and marinate about 3-5 hours. Turn to ensure that all surfaces of chicken are covered. Grill on medium heat about 15 minutes, until chicken is cooked through. Summer. Grilling. BBQ. Some of my favorite things! I would probably say that BBQ sauce is my favorite condiment… I even choose BBQ sauce over ketchup for my French fries. 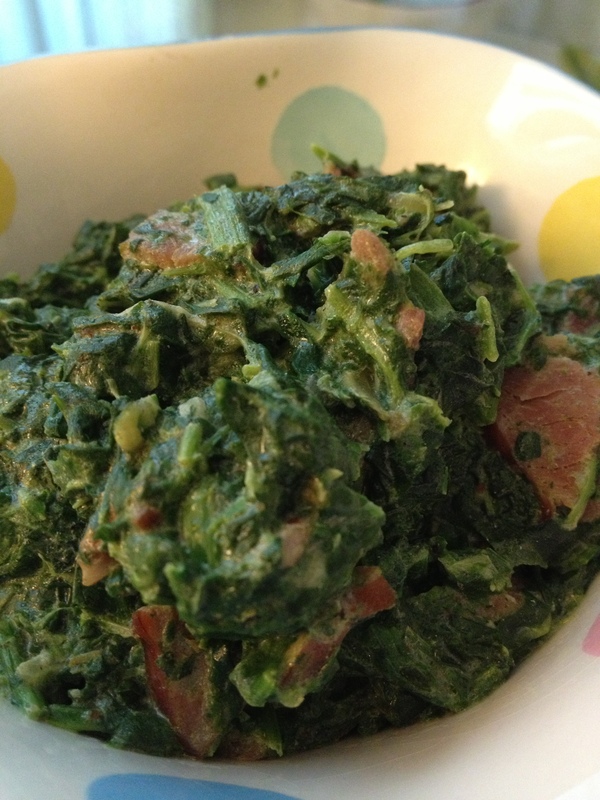 Here is an easy and different mashed potato side dish to complement any grilled summer meal! Wash and dice the potatoes into 1 inch cubes. Steam the potatoes just until fork tender, do not overcook. Let the potatoes cool. Season with salt and pepper. Place the potatoes into a casserole dish, and smash the potatoes roughly. Don’t mash until smooth; leave some texture. Season the potatoes with smoked paprika. Dice the onion and sprinkle on top. 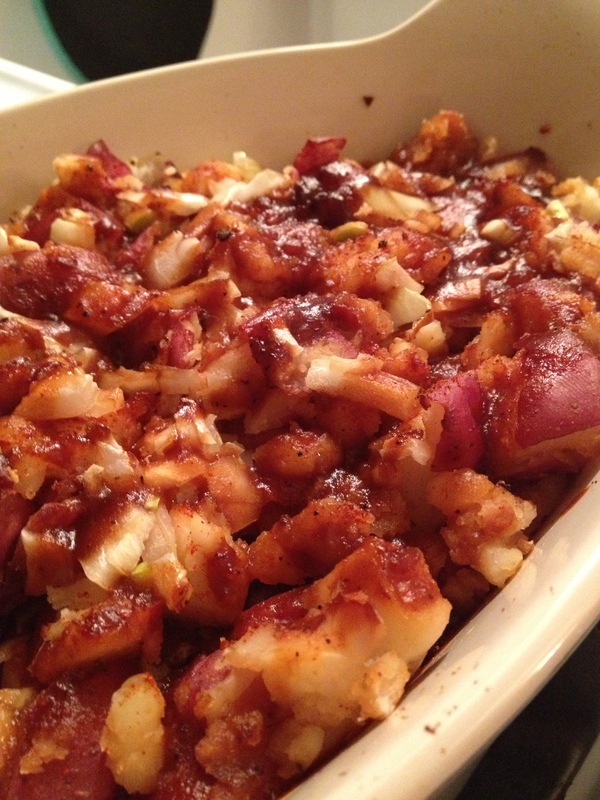 Drizzle the honey over the potato and onion mix. Pour the BBQ sauce on top. 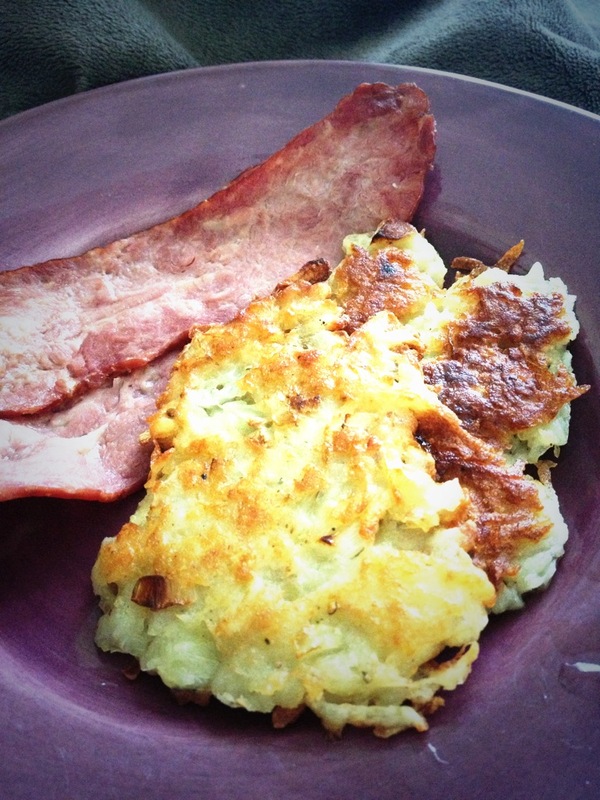 My mother learned this recipe from my Nana and these potato pancakes have marked many of my dinners growing up. 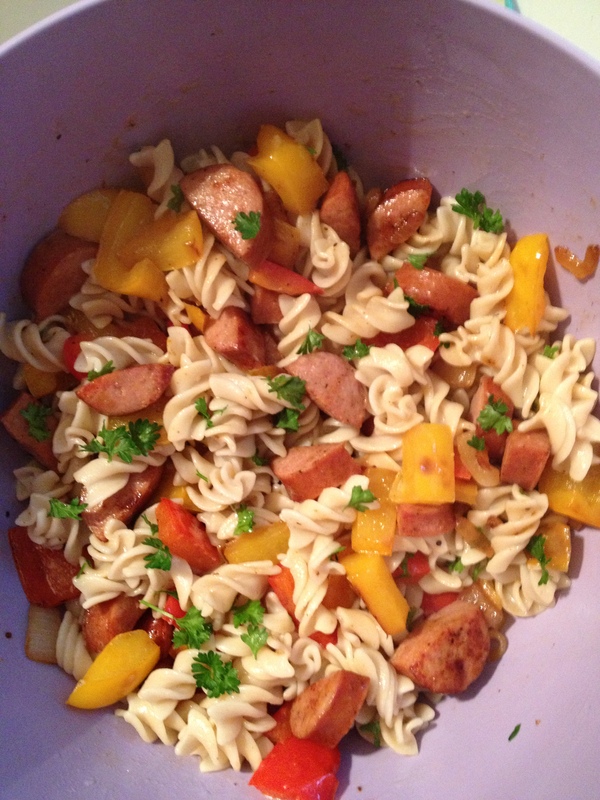 They are easy to make, delicious, and go with practically any meal. For breakfast with a side of bacon. For dinner topped with sour cream and chives. Alongside a burger topped with ketchup. I actually can’t believe I haven’t posted them yet! To make them even heartier for dinner, you can add shredded zucchini or carrots. Grate the potatoes and onion into a large bowl (you can use a large cheese grater). Squeeze the potatoes and onions with paper towels until dry. This step is critical! Add the beaten egg, gluten free flour, salt and pepper. Mix all together. Over medium heat and 1-2 tbsp. olive oil, add the mixture in quarter cup clumps and flatten with a spatula to make pancakes. Fry the pancakes on each side until golden brown. Over a very hot summer weekend, a few friends and I got together to hang out, enjoy some (gluten free for me) beer, and just enjoy the start to summer. 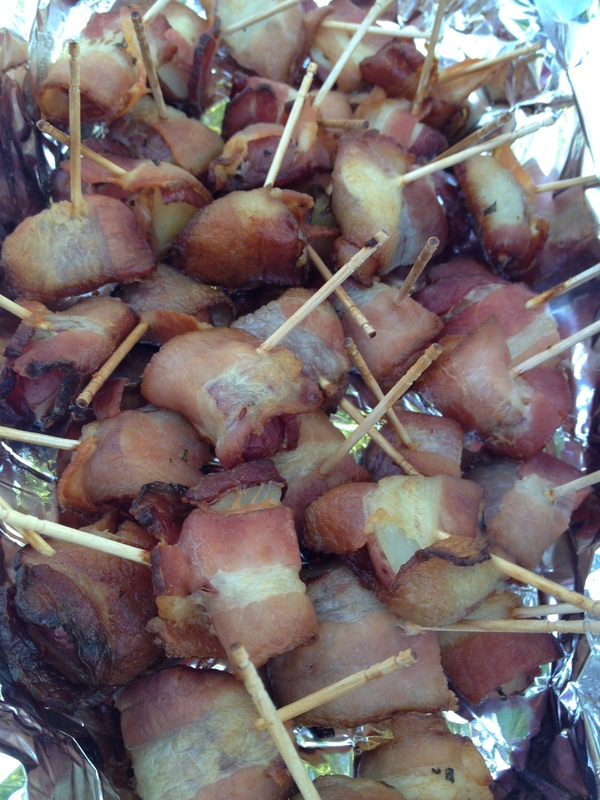 I found a recipe for these bacon wrapped potato bites and knew they were perfect for a crowd. 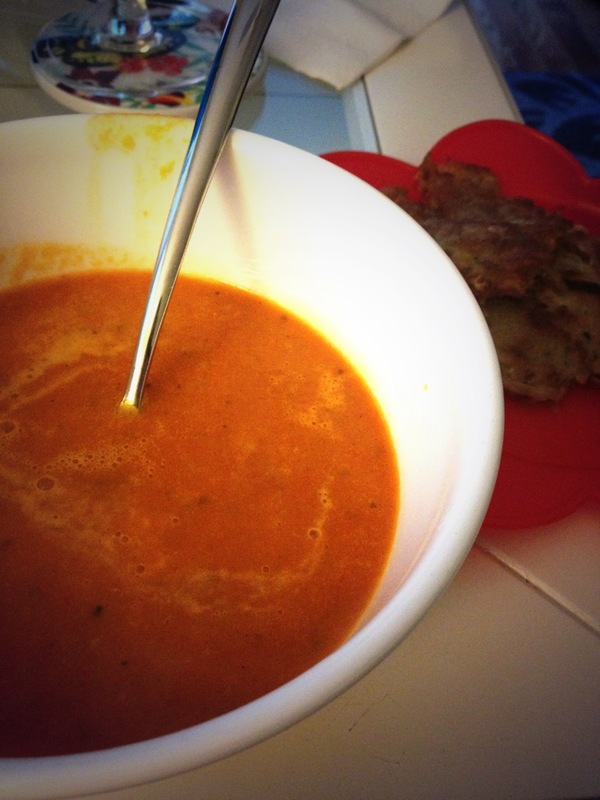 I followed this recipe pretty closely, but did make one change in the dip. The recipe calls for sour cream swirled with hot sauce. Instead, I made a dip for the Tato n’ Bacon Bites that had sour cream, blue cheese dressing, and buffalo sauce in it. Talk about a party pleaser! I will definitely make these again. Note: the dip DOES have dairy in it. Cut the potatoes so that they are bite sized. In a large saucepan, add the potatoes and enough water to cover them. Cover the saucepan and bring to a boil. Boil the potatoes for about 5 minutes, just until barely fork tender. Toss with salt, pepper, and rosemary. Wrap each potato bite with a one third piece of bacon and secure with a toothpick. Bake the bites at 400 degrees about 25-30 minutes, until bacon starts to crisp. While they are baking, mix together the sour cream, blue cheese dressing, and buffalo sauce. Serve hot, and dip in that buffalo goodness! One of the things I miss the most is pizza. 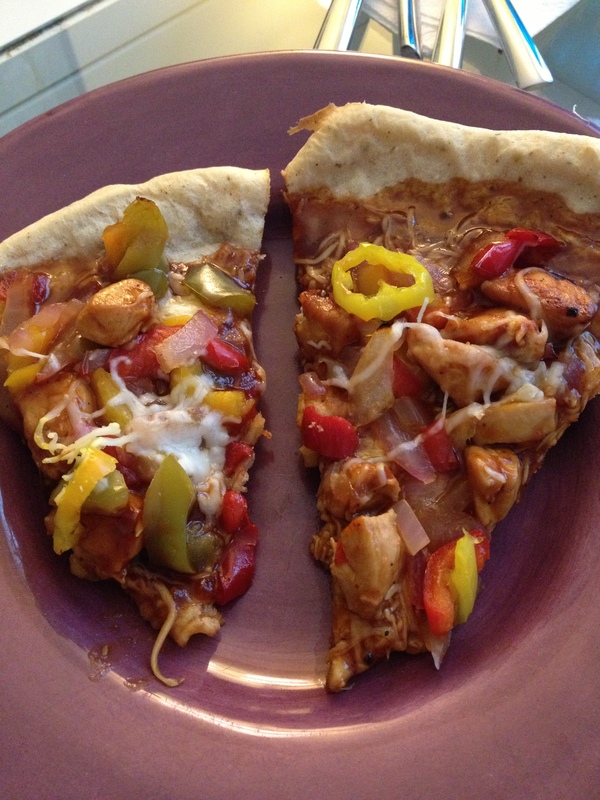 It is tough to find really good gluten free substitutes for pizza, and when you do, they are super expensive. I wanted to try making a gluten free pizza at home, but have never made dough or bread before. 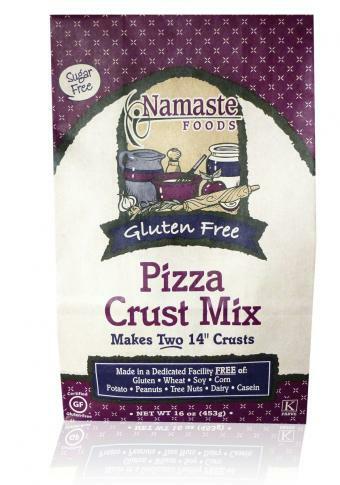 Lucky for me, after just a little searching, I found Namaste Foods gluten free dough! It was $6.99 and makes two crusts! Perfect and cost effective. The directions are also very easy… just add oil and water, spread on a cookie sheet, bake, then add your favorite toppings and bake again! I was so happy with this!